My Boba had 295 speed, everyone else above 200 as well. Dengar was vital to stopping R2. Kill Chewie first. He was entirely sure that his switch from defensive mods to full out crit dmg/crit chance did it. it's very difficult, as advertised. and based off of C3, the only legendary released since, they are not all going to be this hard. Rng is a difficult enemy but not beatable, as stated above, take down chewie first. 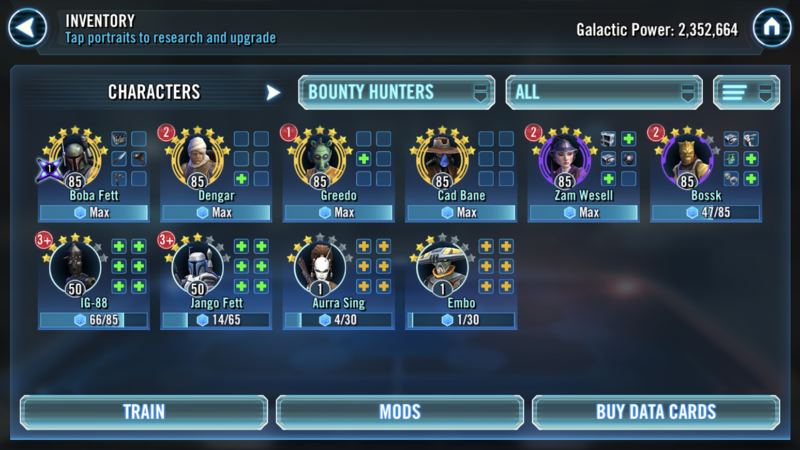 I was finally able to 7* Chewie. Used a boba lead. 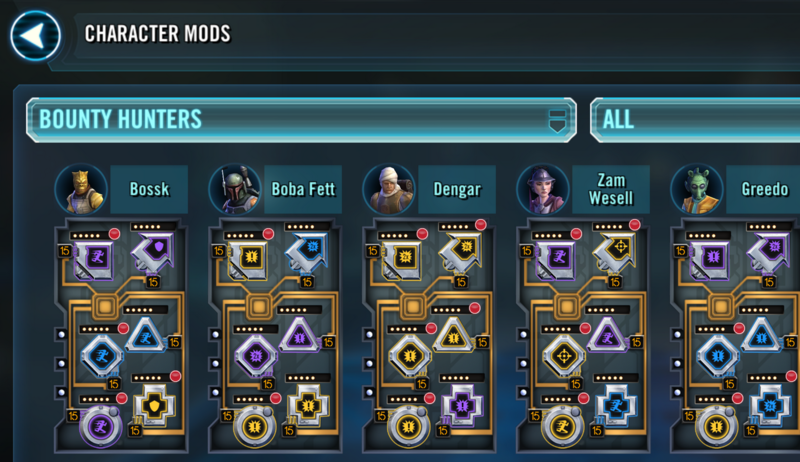 Mods on boba I put CC and CD. Kill order: Chewie, Lando. Han, Leai, R2. Boba and Bossk survived the ordeal. By the way I’ve tried other mods good and bad with same results. 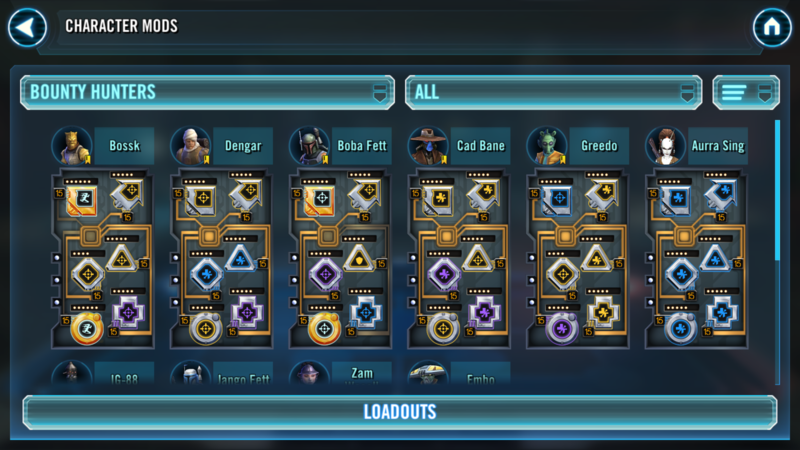 Avoid AOEs - ROLO Leadership is active, so if you AOE with e.g. Rapid Fire you give them all 30% TM. Mods killed this game. Killed this event. Killed it all. It’s the Rian Johnson of GOH. I’ve spent HOURS on this stupid event. I’m over it. As others seem to be. 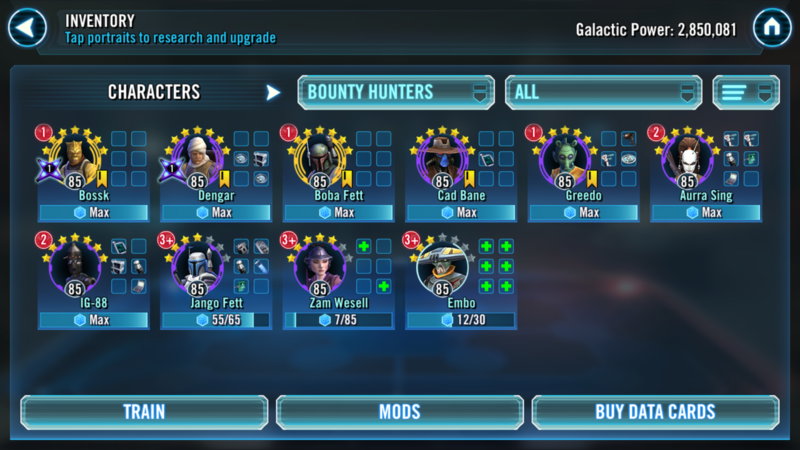 I hope CG finally understand that "challenge" means hard fight not cheat fight. This hidden buffs, full tm on start, full tm from zero and totally rng base fight can be qualified as cheat fight. And what is supposed to be fun make so much stress. Fire designer of this lvl and promote one from CLS legendary - it was cool, a bit hard and without cheat fights. a) Your Team is low speed - I managed with +75 on each (nothing special) but some of those struggling on here are using +10 to +50 which obviously won’t cut it. b) Ignoring ROLOs leadership and using AOE debuffs - Which gives the enemy +30 TM each! G11+ is what CG recommend, I’d suggest G12 on at least Boba (he’s doing the killing), minimum of +75 speed and DONT AOE! Then it becomes much more manageable. P.S. - It’s not fair to compare to CLS which is a)Not a Legendary Event b)Easy difficultly. This event had significant pre-warning that it was going to be very challenging 1st time round. Also, there are the videos/combined experience of those successful first time round to guide those (like me) who needed more time to get a solid team and do it this time. I was once like you... frustrated and burned out on the RNG. This event is 100% mod tuning though. Once modded correctly, it's pretty straight forward with high enough gear.